Two recent cases in the news have stirred new conversations about the need to adequately define and identify instances of paraprofessional neglect in malpractice suits. In one instance in Rhode Island, a Certified Nursing Assistant removed jewelry from a nursing home resident with Alzheimer’s and pawned the items. In another case, a Registered Nurse and two Certified Nursing Assistants were charged with malpractice as a result of the death of a nursing home resident attributed to pressure sores that were a result of being left in urine and feces for several hours. While these may seem like your standard cut and dry malpractice suits they are not. With the changes going on in the healthcare industry that are redefining the professional and paraprofessional roles, you have to know clearly what your state definitions are before proceeding. There has been a move to change the ratio of professionals and paraprofessionals to patients over the past decade. The move is motivated by cost only. More states are allowing for a reduction in the number of professionals to patients on wards and in facilities. More agencies are now hiring paraprofessionals to do many of the tasks that were performed by regulated professionals. The basic definition of the paraprofessional remains that they are certified assistants to licensed and regulated professionals. CNAs, medical technicians, EMTs and others all fall under the paraprofessional role. Nurses and Doctors remain regulated professionals. It is not uncommon to have one RN per shift overseeing 18 paraprofessionals. When neglect happens, figuring out who is legally responsible and what they may be charged with becomes tricky. The best way to understand how the chain of accountability works is to take the following case overview as an example. Mrs. Jones is a resident with dementia in a long term care facility. She needs assistance with continence and is not mobile. One day, Mrs. Jones urinates in the bed. She is left on the urine soaked sheets for six hours until shift change. The CNA on the day shift did not check on her. The CNA on the night shift did and documented the incontinence and changed the linens. As a result of being left on the urine soaked bed clothes for 6 hours, Mrs. Jones developed pressure sores that became infected and are listed as a contributing cause in her death 4 months later. The family brought a suit of malpractice against the agency, the charge RN for the day shift and the CNA on the day shift. In court, the RN was found guilty of malpractice, but the charges were reduced to professional neglect for the CNA. This is despite the reality of the fact that the RN is not the one who is to check on the residents every 2 hours, the CNA is. The ruling was based on the understanding that the CNA is a paraprofessional and therefore unregulated. The RN is a regulated professional who is responsible for the CNA. 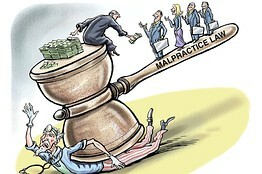 The RN is guilty of malpractice and the CNA is not. In the midst of the case, the facility paid for the defense of both the CNA and the RN. After the case was over, the facility demanded payment back from both for the defense costs. The RN carried professional liability insurance, the CNA did not as they are not considered to be professionals. What would you do to help them both in that instance? As more people begin to age in place there will also be a corresponding rise in negligence and malpractice claims against paraprofessionals. Knowing what is their scope of practice and chain of command within your state is going to be essential to mounting an appropriate defense.